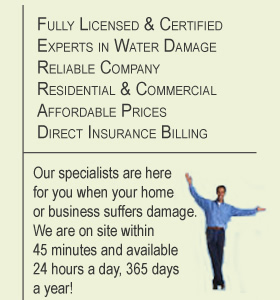 Have you experienced or are you experiencing sewer damage? Sewage damage is a very severe problem - especially if the waste water is leaking into your home or office building. 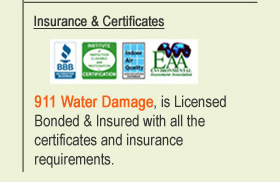 At 911 Water Damage our certified technicians are on call 24/7, 365 days a year, equipped with fully loaded emergency units, ready to handle any sewage backup and ensure that everything is cleaned properly, disinfected and deodorized. It is essential that all of the infected areas are treated, whether it be floorboards, carpets, walls or furniture. Anything that has been contaminated requires immediate attention to prevent the spread of bio- contaminants including bacteria, fungi, viruses and parasites. Sewage backups create a severe health hazard. The longer the contamination process persists, the greater the potential for bacteria development & growth that may lead to some serious illness. 911 Water Damage takes certain steps in order to make the environment of your home or business clean, healthy, and pleasant. We extract all visible contamination.All solid waste The remaining water is extracted. Extraction units will help quickly and effectively pump out any standing water found in your home or business. Dehumidifiers are the strategically placed throughout the site to remove any added moisture that remains in the air. We then use Ozone generators designed to remove smell, not cover them up. We will eliminate odors that may exist from the sustained water damage.